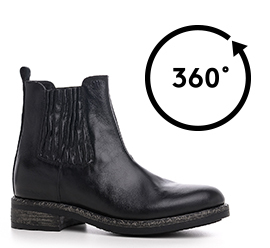 Modern version of the classic Chelsea boot reflecting a refined interpretation of Rock influences. The sleek and slender design is the result of the expertise and creativity of the GM Italian craftsmen, while the upper made of precious full-grain leather is tanned for an aged finish which highlights the dynamic texture as well as the unique wrinkles of the leather covering the side elastic bands. The sole is made of rubber and features a particular vintage effect. The invisible inner elevator system is able to increase height by up to 4 inches (10 cm).